Combi USA announced a recall of over 33,000 car seats last week and said parents should expect repair kits starting in February. Combi USA recalled its Coccorro, Zeus, Turn and Zeus 360 models made through January 2013. The National Highway Traffic Safety Administration (NHTSA) reports the seat straps do not meet minimum requirements. 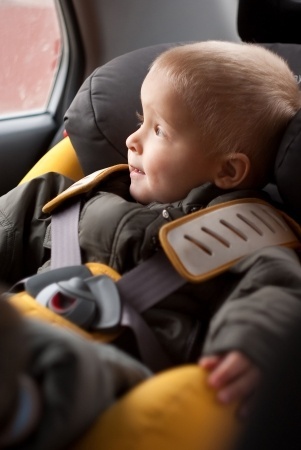 Children may not be properly secured in case of a car accident. The Charlotte, N.C. company said one part of the harness failed strength tests, but the harness as a whole meets safety standards. Seats made after January 2013 do not have this defect. Combi USA will notify owners who have registered their products and mail out free harness replacement kits starting in February. Choosing a safe car seat and learning how to properly install it is a struggle for many parents. There are a number of resources to help make the process easier. Product Recalls.The Consumer Product Safety Commission (CPSC) website provides updates on product recalls. This recall was reported in the media and not listed on the website, but most recalls can be found there. NHTSA. The National Highway Traffic Safety Administration provides online resources about child seat safety ratings. State of Massachusetts. In Massachusetts, children must use some type of child passenger safety seat until they are 8 years old or weigh 57 pounds. All seats must meet federal standards. Read what types are appropriate for each age. Local Police Departments and Organizations. Your local police may have an officer who has been specially trained to fit car seats. This is a free service. Combi USA Recalls More than 33,000 Child Seats, ABC News. The Boston and Cambridge product liability lawyers at Breakstone, White & Gluck have over 100 years combined experience representing injured clients in Massachusetts. We have handled claims for clients throughout the Boston area, including in Cambridge, Quincy, Arlington, Somerville and other cities. If you have been injured, it is important to learn your rights. For a free legal consultation, contact 800-379-1244 or 617-723-7676 or use our contact form.